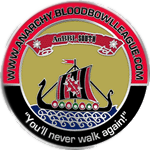 Hosted by Anarchy Blood Bowl League South in Hamar, Nellie’s League run both open and scheduled matches at Nellie Pub in Hamar. Always open for new participants. We play the first Sunday of each month and at other times. AnBBL consists of teams from parts of Norway. Setermoen teams attend the North Conference, while Hamar and Oslo teams attend the South Conference. The league runs a seasonal open league and one or more scheduled leagues.